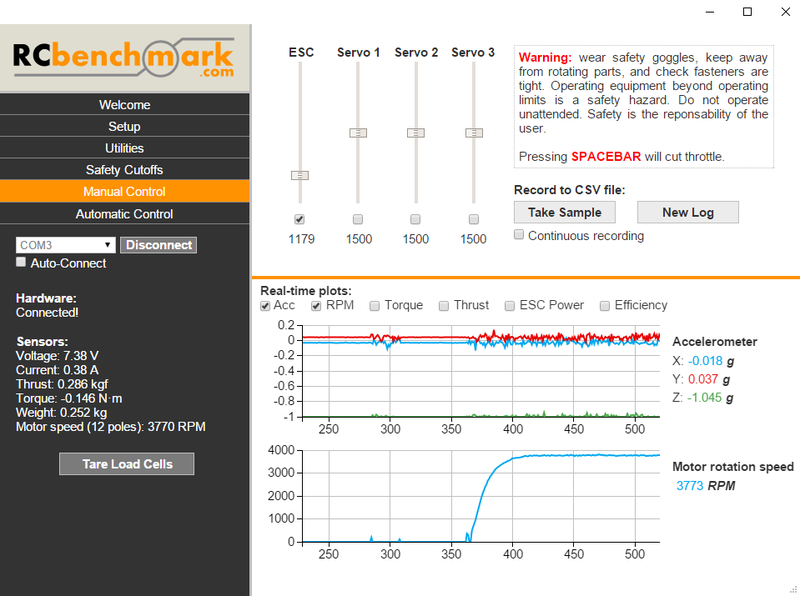 This video tutorial is a quick introduction to using our free RCbenchmark software. This is part 1, where we cover all the software features except the automatic control, which will be covered in part 2. 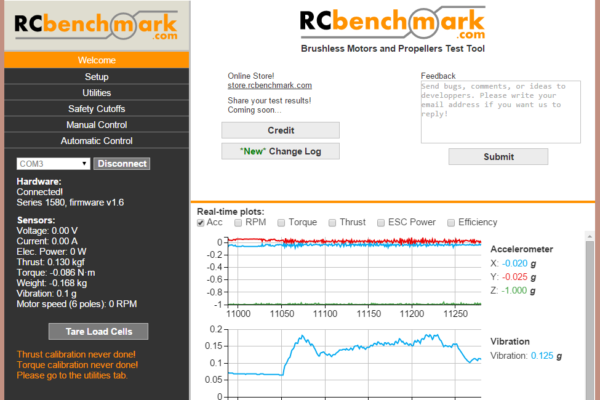 Hi I’m Dominic from RCbenchmark.com. In this video I will go over the software that is included with our dynamometer. We made this video to show you how flexible and easy it is to use our software! This is part 1, where we cover all the software features except the automatic control, which will be covered in part 2. So first, download our software from here. I am using version 0.92.1 of our software. 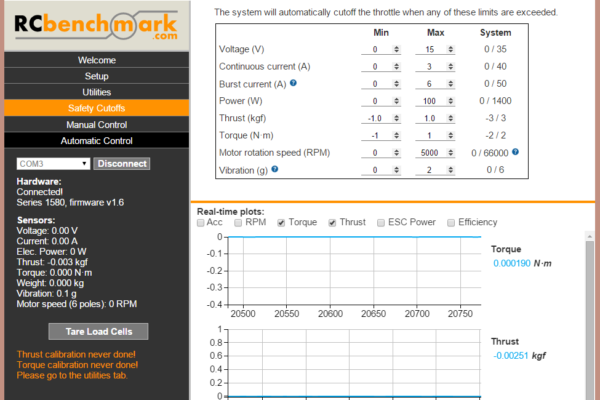 Now I am connecting the dynamometer’s USB cable to my computer. Normally you do not need any special driver for this to work. I see that the software detected two COM ports, but automatically suggested COM3 for me. Without changing anything, I just click connect! 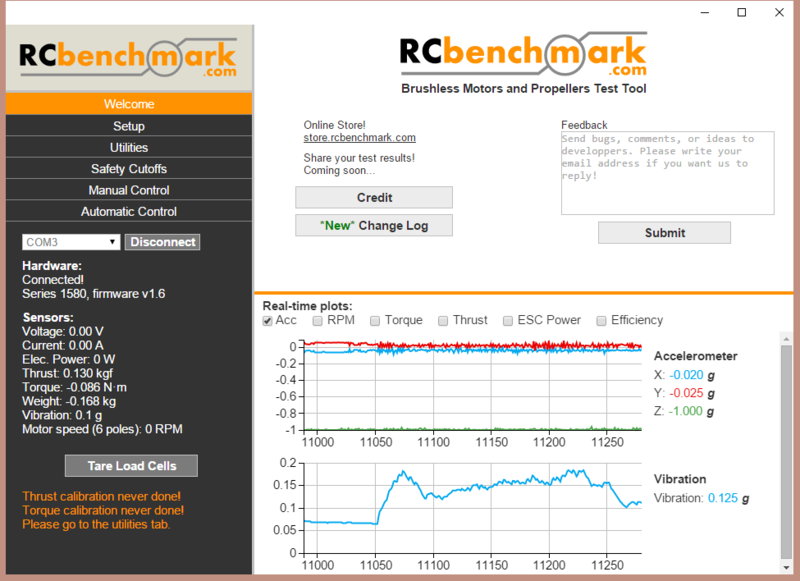 The dynamometer now communicates with our software. The interface is divided into four sections: here on the top left we have the navigation tabs, which affect what you see on the top right panel, which is now the Welcome tab. 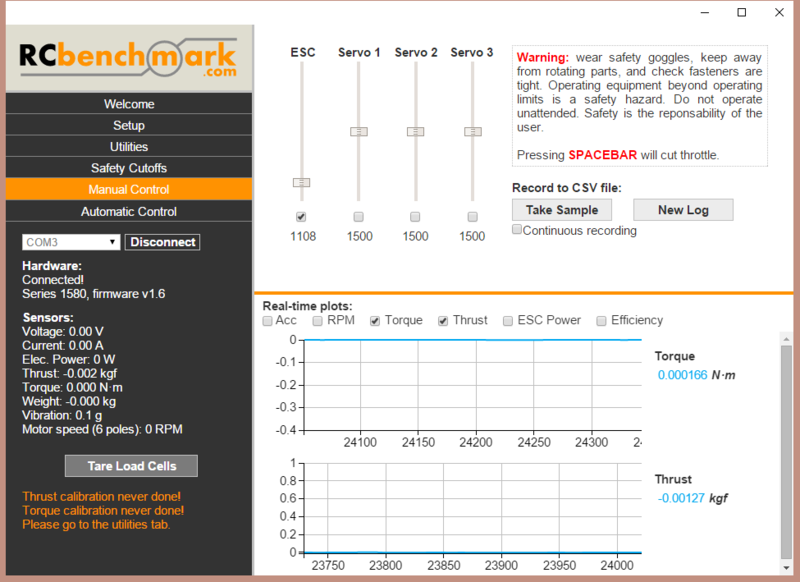 Below it we have real-time plots, showing plots of your sensors. You can select which sensors you want to plot using the checkboxes. Then on the bottom left, we have the control panel. This control panel is always there and you can see sensor values and status information. Let’s go see what is in the setup tab. You can select which units you want to work with, for example if you want to display the thrust in pounds instead of kilograms, this is where you do it. There is a flash firmware button here. Flashing an updated firmware is very simple. The software automatically updates itself. When we release a new firmware, the software will notify you that a new firmware is available and you can click this button. There are no files to download and you will always be sure to have the correct firmware version for your software. Next we have a setting for configuring the number of motor poles you have. 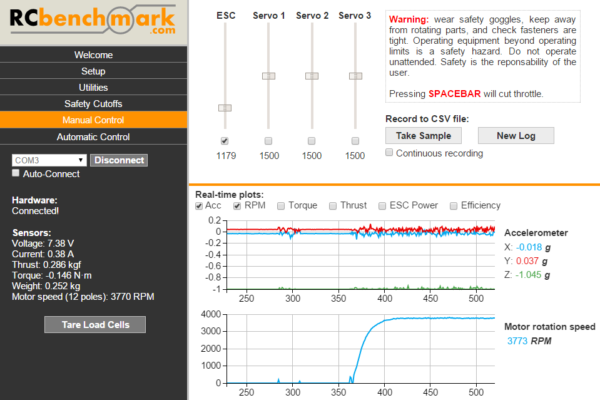 This is important if you want the RPM sensor to correctly read the motor rotation speed. To get more information on how to find out your number of motor poles, just click the question mark. If you plan to record data to CSV files, or if you plan to write your own automation scripts, you will need to choose a working directory. Choose any folder in your computer and the program will use this folder. All the settings you configure in the software will be remembered next time you open it. In the utilities tab, there is a button for reading the ohmmeter on the circuit. 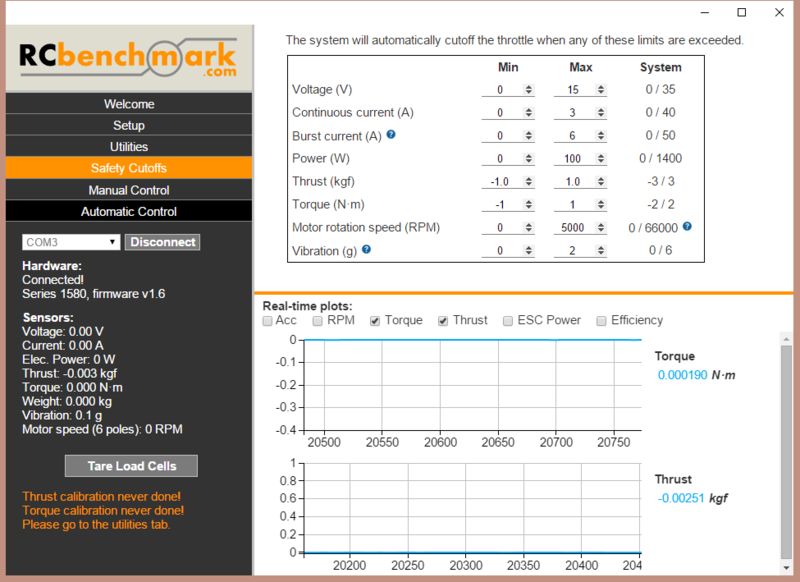 For this demonstration, I am measuring the coil resistance of a brushless motor attached to my circuit. If you look on the bottom left of the control panel, you see orange text telling you the calibration has never been done. 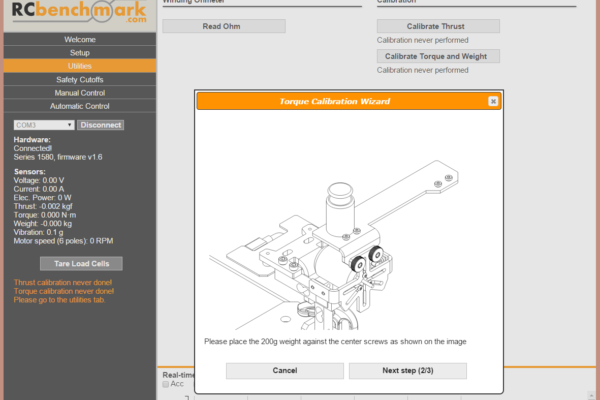 Let me fast foward through the process of calibrating the equipment using the included calibration hardware. 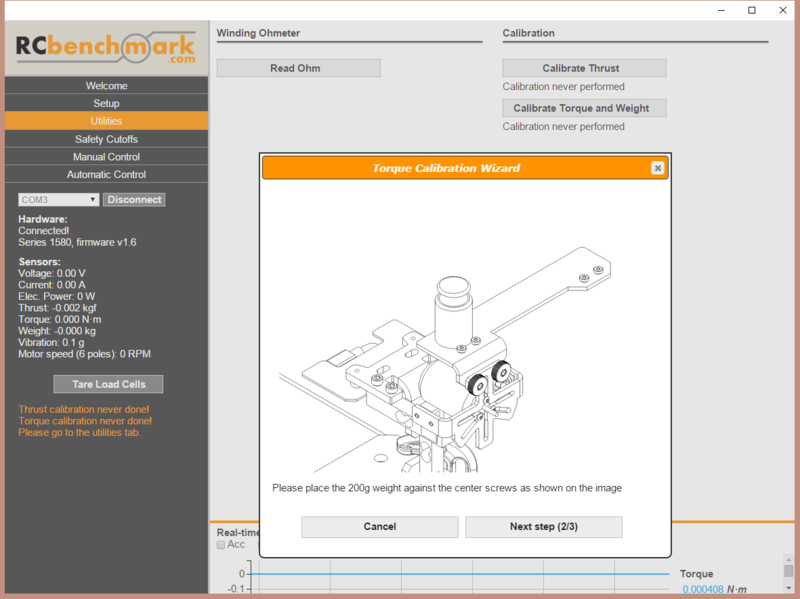 To do the calibration, just follow the calibration wizards in this utility tab. That’s it! The circuit’s load sensors are now calibrated to within 1g accuracy. The safety cutoffs tab is quite important. It constantly monitors all sensors from abnormal values, and will automatically cut off the throttle. These limits have two levels, the system limits, which cannot be changed because they are the limits imposed by our hardware, and the user limits, which you can change to any value suitable to your specific application. A common application is to limit current, in order to protect your motor and ESC. I am setting the maximum motor speed to 2000 RPM. Now let’s go to the manual control tab. The sliders on the left directly control the outputs signals to the ESC and servo connectors. To demonstrate, I already installed a motor, propeller, and battery on the dynamometer. If you want details on this installation process, please check our other videos linked below where we film the installation of the hardware. To start the motor, first we activate the ESC signal, and we move the slider up to start the motor. You can fine-control the signal using the keyboard up and down arrows to 1us precision. The other 3 sliders are to control optional servo motors. For example, you may want to control a variable pitch propeller or you have a swashplate for an helicopter. Now I will show you the safety cutoffs in action. Remember we set the maximum RPM to 2000. Let’s activate the RPM plot to see what is going on and let’s gradually increase the throttle. BOOM the cutoff activated. To restart, you just need to uncheck and recheck the slider. 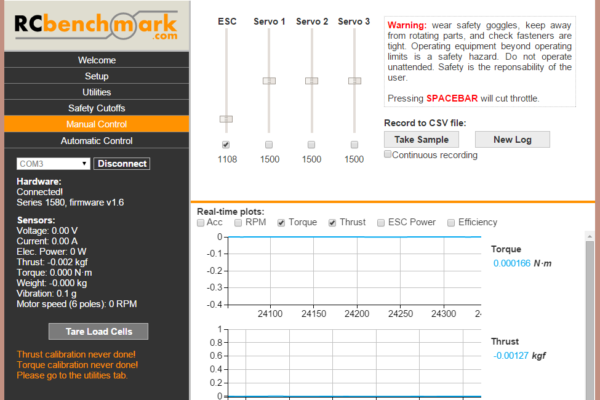 Before you run experiments, you will want to Tare the load cells. It works the same way as the zero button on a kitchen scale. Pressing the tare button will zero your torque and thurst readings. Ok, now we want to record data for our test. One thing we can do is use the “take sample” button. This recorded 3 lines of data in a CSV file. To create another file, just press the “New log” button. Pressing “take sample” again will record in another file. Sometimes you may want to record as much data as possible for dynamic tests. You can do this by checking the continous recording button. Your data file will grow very fast with a lot of information! That sums up all the main features of our software, except for the automatic control. If you are interested in automating your experiments for repeatable and consistent results, please follow the link below for part 2 of this video. Thank you for watching.